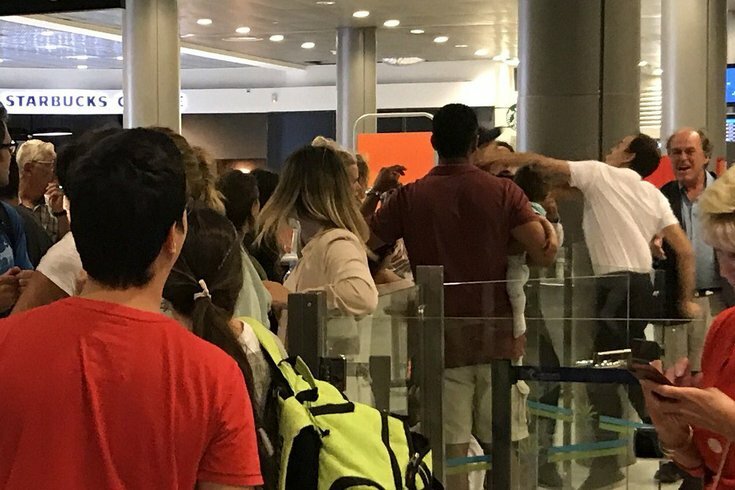 This photo shows an airport employee punching a man holding a baby in Nice, France, on Saturday. An airport worker in Nice, France, allegedly punched a passenger who was holding a baby on Saturday, according to reports. CNN reports the victim was one of several passengers who waited out an 11-hour delay to get on a flight from Nice to Luton, England. A woman who photographed the encounter told the news network her husband restrained the worker after he threw the punch. The man, still holding the baby, was taken away but eventually let on the flight. A director for the airport told CNN the man approached the employee, who works for a contractor, to complain about the delay. When the worker couldn't answer his questions, he unexpectedly threw the punch. According to The Guardian, the passenger was upset over the lack of baby food and seats on the flight. The employee has reportedly been suspended. The operator of the flight, EastJet, said in a statement they were "concerned" to see the photo, noting that the employee does not work for the airline.